I began with Molly Shepard, a Spacer; “The Butcher of Torfan.” I tend to role play a character as “myself,” in that, this is how I would deal with these situations if I weren’t bound by society’s rules and my own insecurities. This is what Nightxade has always been, and what Molly Shepard is. She gets the job done, no matter the cost. She understands that sacrifices have to be made and she understands the concept of “means to an end.” She is ruthless, but that does not mean she is heartless. The sacrifices always cost her a piece of her soul, but she to believe that what is lost is always slightly less than what is gained in the end; victories are always Phyrric. She is willing to die for the cause, but finds far greater value in fighting and surviving to keep on fighting, because no one can predict what comes next, and she doesn’t believe that anyone else but her is capable of handling those unknowns. Those were her last thoughts as she watched the Normandy die and felt the life drain from her own body. That is why she had no qualms about working with Cerberus, because it was a means to an end within a much bigger picture that the Council refused to see – though she gave The Illusive Man no illusions in terms of where her loyalties lay. Molly is a soldier to the core, a leader and a proud human. That is why Admiral Anderson and her father, Admiral Hackett, can always count on her and will always back her decisions. I’ve come to realize that, even though we have so much control over our Shepards, we were never given a blank slate to work with. Under our decisions is a proud, confident and determined soldier and leader who can be counted on to press on and to get the job done. We get to control whether or not Shepard does that with compassion, bitterness, callousness or downright assholery. 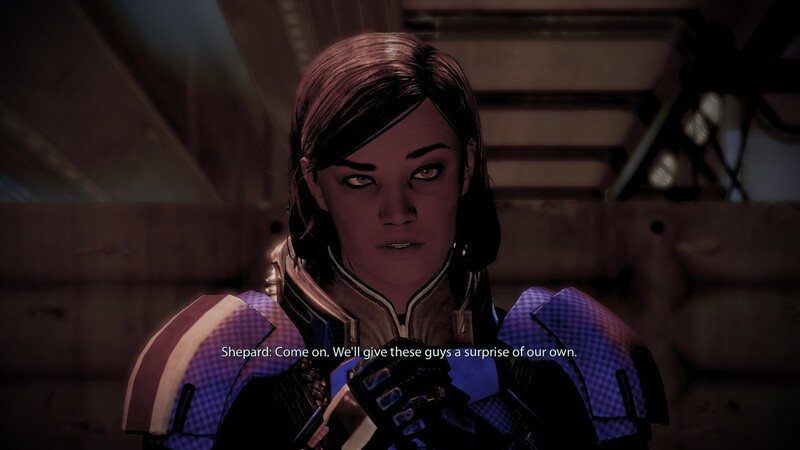 We get to control how many enemies and bodies Shepard leaves behind and how many friends and allies stand by her side. I subsequently created two more Shepards, initially to simply play out decisions in a different mindset than Molly to see what happens, but Tarisa and Ian Shepard have grown on me. Tarisa is a Paragon, for the most part. She’s an earthborn sole survivor suffering from survivor’s guilt that leaves her with the almost irrational determination to make sure everyone under her responsibility makes it to the other side safely, even at the cost of her own life.